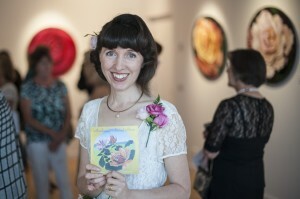 I am an artist and I paint up close and personal portraits of roses on circular canvases. I have also published an inspiring gift book ‘Awakening Around Roses’ combining beautiful photos of my paintings with uplifting quotes from artists and poets. I am also working on getting some of my painting designs made into beautiful round rugs. The inspiration behind this collection of paintings came from a vision I experienced on awakening from a coma following emergency brain surgery to repair a ruptured blood vessel. In this vision I found myself in a beautiful light-filled rose garden and I knew that I must share this vision of beauty and hope with the world. This vision hastened my recovery and illuminated my path forward as an artist. Although I have a range of paintings and product for sale, I believe what I am really offering is inspiration and the suggestion that we should all take the time to smell the roses and nurture our dreams so that they can awaken and flourish like the opening petals of a rosebud. My biggest challenge has been finding ways of connecting with my audience and sharing my story and what I do. When I have had the opportunity to show my work to people they really love it and find it very uplifting and motivating, but as of yet the exposure of my art has been very limited. I have exhibited my paintings in my local area, I have developed a website and a blog, I have a small presence on Facebook and Twitter and I write a monthly inspirational art newsletter for my email subscribers. Discovering Project Eve has injected a whole new level of positivity & excitement into my world. The number of helpful and motivating articles that appear on the Project Eve twitter feed is really quite amazing and it’s lovely to feel part of this supportive community. My insider tip is for boosting your creativity regardless of what industry you are in. Immerse yourself in inspiration, place fresh flowers and hang beautiful artworks in your working and living spaces, visit local gardens and art galleries, borrow a stack of gorgeous photographic books from the local library, inject a bit of colour into your working wardrobe, find yourself a special notebook and write done all those wonderful thoughts that come into your head!.